The library, archives, and museum world is abuzz this week with #ColorOurCollections, a weeklong cultural heritage coloring fest dreamed up by the New York Academy of Medicine and the Biodiversity Heritage Library. As coloring fans ourselves, we couldn’t help but toss our hat into the ring. Earlier this week, we shared a University Archives coloring book and a Local History coloring book, but we’ve saved the best for last. 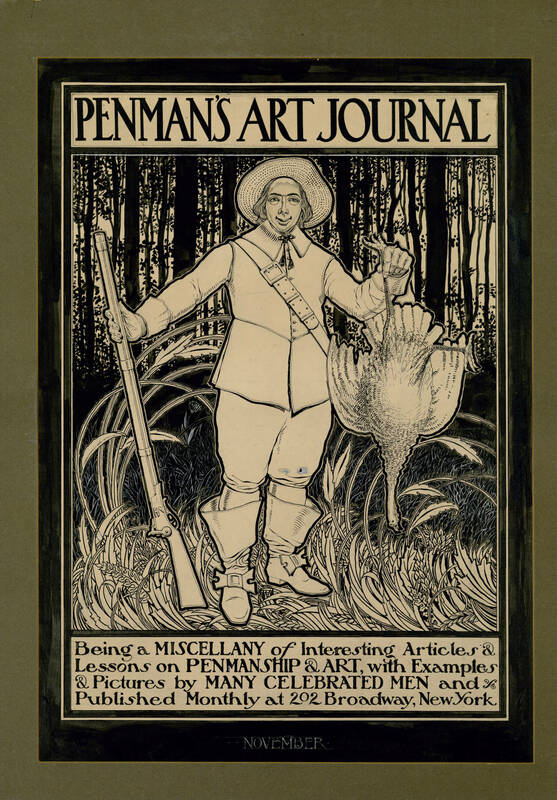 Today’s coloring book features some gorgeous penmanship from the Zaner-Bloser, Inc. / Sonya Bloser Monroe Collection and the Horace G. Healey Collection, both preserved in our Helen Gallagher McHugh Special Collections. 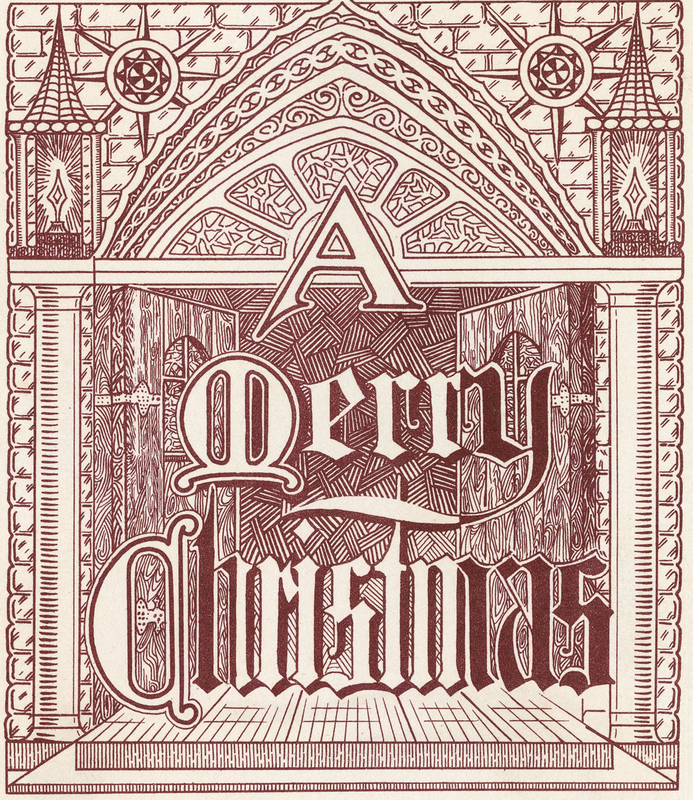 Featured at the end are works by Scranton’s own master penman P. W. Costello. 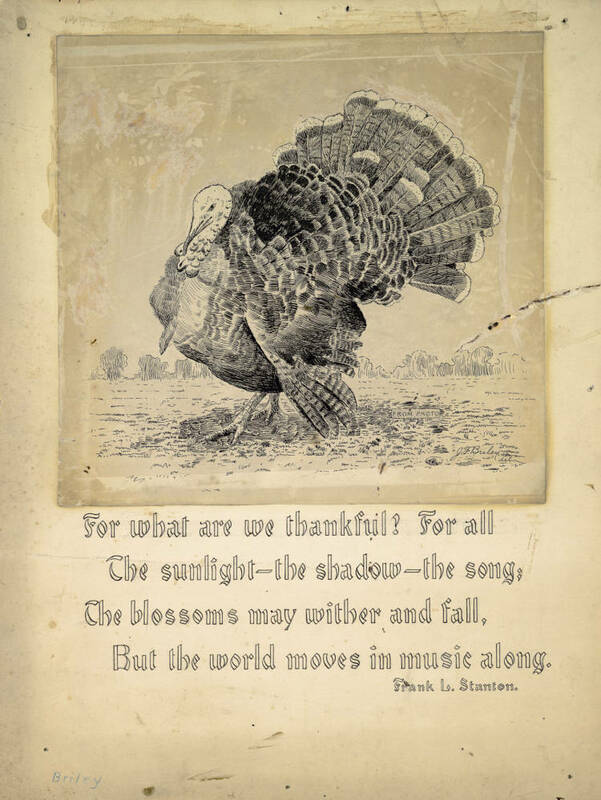 The pages in the book were created using images from the Library’s digital collections, which were digitized from original artwork, publications, and albums. Please note: We’ve edited the images to increase their “colorability.” In many cases, this process obscured some of the incredible detail and shading in the original work. We encourage you to explore the master scans (and the many, many other items in our collections!) 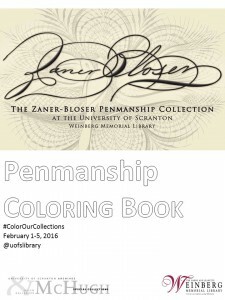 at www.scranton.edu/library/zanerbloser. We hope you enjoy our book, and we can’t wait to see what colors you bring to our collections! One of the most highly prized jewels in our Helen Gallagher McHugh Special Collections is the Zaner-Bloser Penmanship Collection, one of the most extensive collections of American ornamental penmanship from the late 19th and early 20th centuries. Over time, we’ve been digitizing parts of the Zaner-Bloser Collection to make it more accessible to researchers and penmanship enthusiasts around the world. 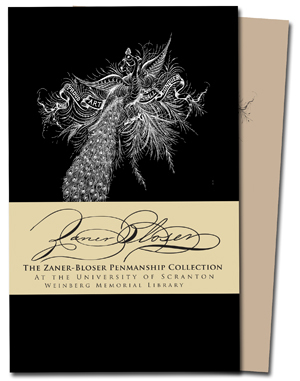 We’re now happy to announce that more than 500 photographs of celebrated masters and instructors of penmanship from the Zaner-Bloser Collection are now publicly available online. 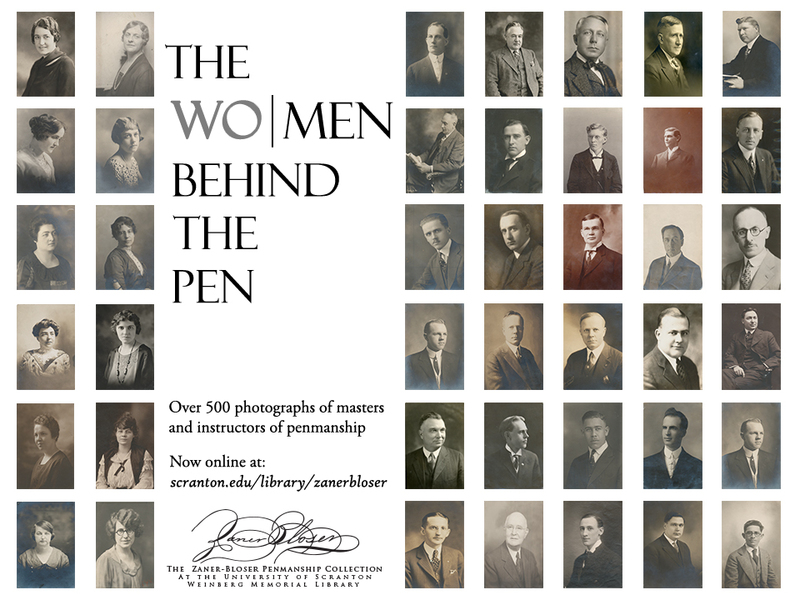 The photographs (96 portraits of women and 453 of men) were gathered by Zaner-Bloser for publication in penmanship journals like the Business Educator. Few of the photographs are dated, but we estimate that most of them were taken between the early 1900s and early 1940s. Some of the photographs are portraits of celebrated master penmen, including several members of Michael Sull‘s Penman’s Hall of Fame. Others are lesser known teachers and instructors, some of whom we weren’t able to identify (please contact us if you recognize them!). None of these photographs would be online today were it not for Thomas W. Costello, who spent many hours carefully digitizing the portraits for us. Tom’s great-grandfather is Scranton’s own master penman P. W. Costello, who has three portraits in the collection. Tom described the photograph collection as a “wonderful, well-deserved tribute to the masters and many of the dedicated unsung heroes who worked under the radar teaching penmanship.” We couldn’t say it better ourselves. Thank you, Tom, for bringing the men and women behind the pen into the spotlight. Many thanks to ArchiveGrid Blog for including our custom-printed Zaner-Bloser Moleskine Notebooks on their list of “24 Fun and Practical Gifts for Archivists”! We’re proud to share a blog post with these nifty Oinx microfiche necklaces and Green Market’s “The Archivist” scented candles. As always, all proceeds from notebook sales benefit the preservation and digitization of our Zaner-Bloser Penmanship Collection.